1) Both the (TPJ & STS light up for social interactions and to control attention. Graziano, extends this to say that we use the same cognitive machinery to observe our own consciousness as we do to observer others. 3) It is all just information in the brain. 5) Religious beliefs are inherent in humans. I do have a pet peeve, tho. Graziano marvels that all this smart people do not understand that white light is the combination of all colors. The brain models white as the absence of color. That is an excellent model for pigment. White is the absence of color. Colored light is an extremely recent experience for humans, sure, now anyone who does computer graphics or edits web pages knows that white light is the full combination of RGB (#FFFFFF). These are raw notes: These are all direct quotes from the book. A specific network of brain areas in the cerebral cortex is especially active during social thinking, when people engage with other people and construct ideas about other people’s minds. Two brain regions in particular tend to crop up repeatedly in experiments on social thinking. These regions are called the superior temporal sulcus (STS) and the temporo-parietal junction (TPJ). These regions are called the superior temporal sulcus (STS) and the temporo-parietal junction (TPJ). Maybe the same machinery responsible for attributing awareness to other people also participates in constructing one’s own awareness and attributing it to oneself. All of these items are encoded in my brain as chunks of information. I am aware of a great diversity of information. The second component shown in the diagram is the act of being aware of the information. That, of course, is the mystery. Not all information in the brain has awareness attached to it. Indeed, most of it does not. p22 - The theory can be put in a sentence: Awareness is a description of attention. p24 - Visual stimuli are represented by patterns of activity in the visual system. The many representations in the visual system are in constant competition. At any moment, one representation wins the competition, gains in signal strength, and suppresses other representations. The winning representation tends to dominate processing in the brain and thus behavior. A similar data- handling method is thought to occur in other brain systems outside the visual system. The brain constructs chunks of information to describe the color of the apple, the shape of the apple, and the motion of the apple. These features are bound together to form a larger description of the apple. According to the present theory, the brain also constructs a chunk of information to describe one’s own attention being focused on the apple. p30 - Humans have an ability to monitor the gaze of others. We know where other people are looking. The scientific work on social attention, as it is sometimes called, has tended to limit itself to detecting someone else’s gaze direction. 17 , 22 – 24 But I doubt that our sophisticated machinery for understanding other people’s attention is limited to vector geometry based on the eyes. Computing where someone else is looking is, in a sense, incidental. Computing someone else’s attentional state is a deeper task. I argue that we have a rich, sophisticated model of what attention is, of how it is deployed, of its temporal and spatial dynamics, of its consequences on action. A model of that type is essential to understanding and predicting another person’s behavior. Gaze direction is merely one visual cue that can help to inform that model. After all, blind people, with no visual cues about someone else’s gaze direction, still understand other people’s attention. p72 - Blanke and colleagues 5 suggested that there is a primacy to constructing a body- centered understanding of oneself, a model of oneself as a physical being with a location and a specific spatial perspective on the external world. Constructing this physical understanding of the self is, in their view, important to the construction of consciousness. The extromission myth of vision is the myth that we see by means of some substance that emanates out of the eyes and touches objects. p79 - Let us use the term substance A to refer to the physically impossible entity that is described by the information set A . Substance A has a strong resemblance to res cogitans , the fluid substance of the soul that Descartes described. It is ectoplasm. It is spirit. It is the stuff that angels, ghosts, and gods are made of. It is the stuff that, in most cultures and most religions, is supposed to survive the death of the body. I am not proposing that the brain contains spirit. I am proposing that the brain constructs an informational model and the information describes spirit more or less as people have intuitively understood it for millennia. I noted in a previous chapter that, before Newton, people intuitively understood white to be “pure” or lacking all color. Most of us still tend to think of white in that fashion even though we know better intellectually. p124 - The social theories of consciousness share the following three properties. First, the brain actively constructs an elaborate description or model or narrative about its own processing. Second, that self- descriptive information is often wrong. The system that computes it has limited capacity and relies on limited cues. Third, the machinery that computes the self- description is also used to compute explanations of other people. We understand ourselves and other people partly through the same means. p138 - In 1983, Baars 1 , 2 proposed the global workspace hypothesis, one of the first well- articulated theories of consciousness as integrated information. p160 - colleagues focused their study on a region of the brain called the inferior temporal cortex, shown in Figure 13.1 . Neurons in this region became active in response to the sight of objects. A subset of the neurons, about five percent, became active only when the monkey was shown a face— either a real face or a picture of a face. Another subset of neurons responded to the sight of a hand. These stimuli are of obvious social importance to monkeys. Further work on the monkey brain revealed a second cortical area that seemed to process an even greater range of socially relevant information. This area, the superior temporal polysensory area (STP), is also shown in Figure 13.1 . A high percentage of neurons in this area responded when monkeys were shown pictures of faces, pictures of eyes in particular, and movies of bodies and limbs in action. 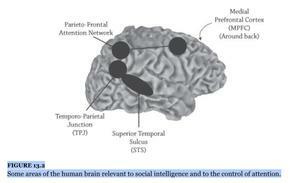 3 – 7 FIGURE 13.1 Some areas of the monkey brain relevant to social intelligence. I saw some of the later experiments in Gross’s lab on area STP in the monkey brain and witnessed one particularly common class of neuron. “Looming” neurons responded best when a person walked up and loomed toward the monkey’s face. Such looming responses were a puzzle at the time, but now I wonder if they might have been related to personal space, another socially relevant property. Area STP seems to be the hot spot in the monkey brain for processing socially relevant signals. It has the highest concentration of such signals, at least that has been found yet. p162 - The human STS is shown in Figure 13.2 . This cortical area becomes active when a person sees or thinks about the intentional actions of other people, such as hand actions, or changes in gaze direction, or facial expressions. 9 – 15 It reacts differently to clearly goal- directed actions, such as a movie of a hand reaching out to grasp a cup, than it does to non- goal- directed actions, such as an arm movement that looks as though it has no purpose. 16 Even when a person views simple geometric shapes that move on a computer screen, when the movements are perceived as intentional— the triangle “wanted” to touch that square— then the STS becomes active. 17 The STS therefore may be computing something about the perceived intentions of others. p166 - When people perform this type of task, the false- belief task or other tasks that tap into social cognition, a specific network of cortical areas tends to be recruited. Many of the same brain areas show up regularly in a great range of experiments. Three areas in particular are most commonly reported. 21 – 28 These areas are shown in Figure 13.2 . They include the superior temporal sulcus (STS), the temporo- parietal junction (TPJ), and the medial prefrontal cortex (MPFC). The STS and the TPJ are adjacent to each other and in some ways could be considered part of a larger cortical region that may have distinct subregions. The MPFC is separated from the others. It lies in the frontal lobe and near the midline of the brain. Each area is doubled— one in the right hemisphere, one in the left— but the activity during social cognition is almost always much stronger in the right hemisphere. Other brain areas are also active during social cognition, but the three noted here are among the most commonly studied. p177 - Multiple Interlocking Functions of the Brain Area TPJ In the previous chapter I pointed out a strange coincidence, if it is a coincidence. A region of the brain, encompassing the temporo- parietal junction (TPJ) and superior temporal sulcus (STS), is active during social thinking. This brain region is recruited when people think about other people’s minds. Yet the same general region of the brain, when damaged, can cause a devastating disruption in one’s own awareness of the world. It can cause clinical neglect. To me, the overlap of these two properties provided an initial clue. It suggested a deep connection between social thinking and awareness. It suggested that just as we use our social intelligence to attribute awareness to someone else, we may also attribute awareness to ourselves. Awareness itself may be a construct computed by some part of the social machinery. Attention is a competition among signals in the brain. The competition fluctuates as various signals rise up in strength and then sink down again to give play to other signals. Attention has a self- dynamic. It can, however, be guided by specific control signals in the brain. These control signals do not entirely dictate the state of attention. Instead, they bias it. They help to shape the ongoing competition. In a now well- accepted view that I discussed in previous chapters, these biasing signals that help to guide attention are generated mainly in the parietal and frontal lobes, in the so- called parieto- frontal attention network. One set of experiments, however, obtained surprising results that seemed to conflict with the traditional view. When a person’s attention was shifted to a new location, especially to a sudden or unexpected stimulus, the brain showed elevated activity in a set of areas including the TPJ, some parts of the STS, and a region in the lower part of the frontal lobe. 1 – 3 The brain activity was strongest in the right hemisphere. p202 - The theory of consciousness proposed in this book, once its implications are thought through, ends up standing on the side of conventional intuition and against the contrarian views. Awareness is an informational model, a description, a picture; but the depiction directly alters the thing that it depicts. It has the capacity to shape the processing in the brain and to control behavior. In an earlier chapter I suggested that awareness was something like the mission statement of a business. It is a description that also makes it so. The attention schema theory allows awareness to serve both as a descriptive model and as a controller, and that double function lies at the philosophical heart of the theory, just as it lies at the heart of the human intuitive understanding of consciousness. p212 - Consider human spirituality— the tendency to see spirits everywhere, to see mind not only in ourselves and in each other, not only in pets and other animals, but also in cars that we get mad at when they don’t start; in house plants that we talk to as we water them; in the favorite stuffed animals of children, like Hobbes of Calvin and Hobbes; in storms that seem like the products of angry spirits; in the empty spaces at night when you get the creepy irrational feeling that someone is in your house uninvited. It is really only a small step from the universal perception of mind everywhere to the more formalized notions of ghosts, angels, devils, and deities. However much the nonsuperstitious may smile at the superstitious, we are all engaged in more or less the same habit: actively constructing a perceptual world suffused with spirit. We are all spiritual. Let me make sure the statement is unambiguous: even the atheistic scientists among us, such as myself, cannot help being spiritual. It is built into our social machinery. It is what people are. p225 - Without consciousness, the God concept becomes meaningless. If God is a nonconscious complex process that can create patterns and direct the affairs of the universe, then God obviously and trivially exists. The physical universe itself fits that description. p227 - My point in this theological section is not to try to twist science until it can justify religion. I am not attempting to shore up deistic thinking. I am also not trying to knock down religion. In the context of this book at least, I have no social or political agenda. The brain is what it is; people are the biological things we are. My interest here is narrowly scientific. 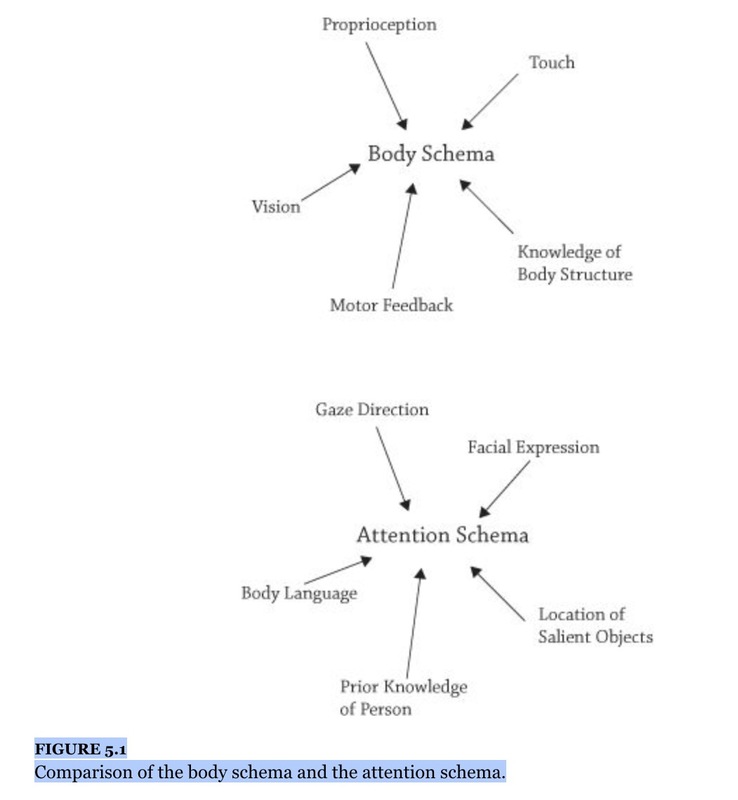 The attention schema theory is my best scientific attempt to understand the biological phenomenon of consciousness. When I try to put aside the rationalizations, spin, agendas, and culture wars, when I try to apply the theory to some of the deepest human questions, questions about philosophy and culture and religion, the resulting answers are weird and fit no expected form. They do not entirely vindicate either side of the standard debates. They disturb everyone all around. The conscious mind is a mechanistic computation but it also has a type of free will. The spirit world exists but only as information instantiated on the hardware of the brain. It has a perceptual reality that is hard to ignore, if not a literal reality. In the same way, the deistic consciousness does and doesn’t exist. A ventriloquist puppet is and isn’t conscious. Spirits are and aren’t present. Consciousness can and can’t survive the death of the body. p236 Newman, J., and Baars, B.J. (1993). A neural attentional model for access to consciousness: a global workspace perspective. It is just not the same to read this on kindle. I do not have the visual notes and clues and page locations and personal writing in the margins to draw upon to put together notes…sigh. YON jch.com - Follow your bliss!